Many older in-service vessels built from SA-212 coarse grained carbon steel do not meet current code requirements for low temperature service. The service history on these vessels is good, resulting in an attitude that the current code rules are too restrictive. However, there is an alternate way to understand these vessels: many are in service conditions like propane storage where the pressure at lower temperatures can never get very high. Many of these vessels can never experience situations of combined high pressure and low temperature. A propane storage vessel typically has a pressure rating of 250 psi. In Canada it can also have -50°F MDMT (Minimum Design Metal Temperature) depending on the service location. What it does not experience is 250 psi at -50°F. 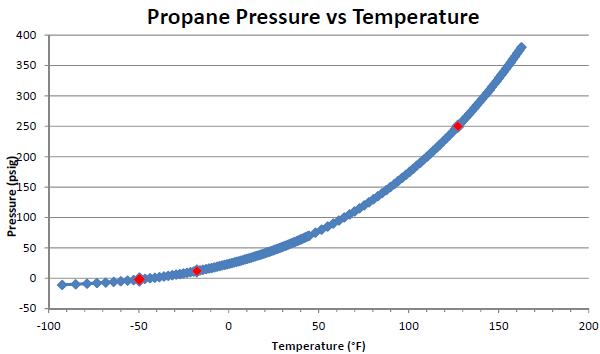 The pressure temperature curve for Propane is shown Fig-1 below. Some data points have been highlighted on the propane P-T curve. At -50°F, a common design temperature for exposed locations in Canada, the pressure in a propane storage vessel is a small vacuum of -2 psig (or 13 psia, 2 psi below atmospheric pressure) – if the valve is open, air will enter the tank instead of propane exiting. At -20°F, a common minimum temperature for older design codes, the pressure is still only 11 psi. At 250 psi, a common propane design pressure, the temperature is 127°F. Once the contents of the vessel reach this temperature, a 250 psig relief valve will open allowing the release of some gas reducing the temperature of the remaining contents through boiling heat transfer. We designed a sample vessel with a minimum wall thickness to just pass 250 psi service. 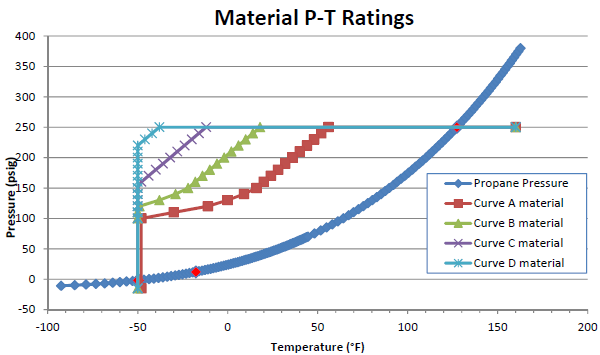 In different calculation runs, the material category was changed from Curve A to B to C to D. A crude generalization is that Curve A represents coarse grained materials with poor low temperature impact (toughness) properties like some SA-212 materials. Curve D materials have the best properties obtained through methods like normalization or quench and tempering. Curve B and C are intermediate materials. The program reported the allowed minimum temperature for the design as the pressure was changed (Fig 2). For example, the coarse grained Group A material had a minimum temperature of 50°F for the full 250 psi service. In comparison, the curve D material was good all the way down to -35°F. But for all material groups, by lowering the design pressure, lower minimum temperatures resulted. Although the strength dropped as the temperature dropped, in all cases the vessel pressure rating exceeded the propane P/T curve. Fig 2 shows that all could be used safely, however, curve A in this case could not reach all the way to -50°F. The Curve A material can be seen to have the poorest pressure rating at low temperature, and the Curve D the best. When a vessel is designed for new construction it is possible to combine the selection of material with the appropriate testing to obtain MDMT of -50°F, even at full pressure. However, for this sample vessel, no material combination provides a full pressure rating at -50°F. Fig 3 – Just looking at curve B material. UG-20(f) allows the full pressure to be used down to -20°F. A second rating of 115 psi covers the range from -50 to -20°F. 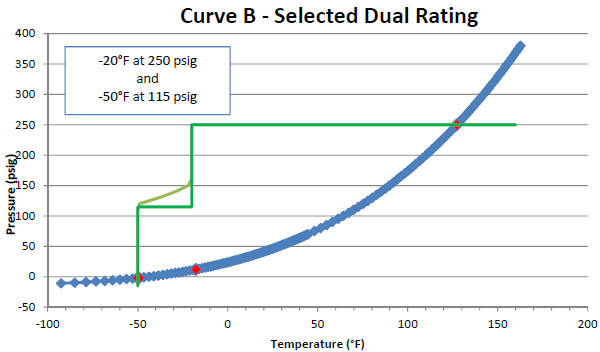 The design based on curve B material has been dual rated: 250 psig at down to -20°F and 115 psig for down to -50°F (Fig 3). This is recorded according to the rules of UG-116(a(5) footnote 37 which does not restrict the number of minimum temperature pressure combinations used. One full calculation set is required for each P-T combination. Two full calculation sets are required for this vessel: the first is calculated at a pressure of 250 psig and shows a minimum temperature of -20°F; The second is calculated at 115 psig and shows a minimum temperature of -50°F. As an alternative to using these curves, it is possible to impact test materials and welds. In general it does not pay to be optimistic about coarse grained materials and welds passing impact tests prior to seeing the actual test results. ASTM SA-212-39 (S-55) was put into Section II in the 1940 edition of the Code. There were two grades in S-55: A and B, each with two different minimum tensile strength requirements controlled by carbon content. In 1952… it was required in SA-212 that plates intended for low-temperature service must meet the impact requirements in SA-300. SA-212 could be purchased to a fine-grain-melting practice-and subsequently normalized and tempered-for low temperature service, or purchased to a coarse grain-melting practice; the single specification permitted the manufacture of both plate grades. The SA-212 Specification continued up to 1962 as the carbon steel plate material of choice for low-temperature service for boiler drums and pressure vessels. [In the] 1968 edition of Section II … the SA-212 Specification was deleted …it was replaced with two specifications. The SA-212 steel plate melted to coarse-grain practice was replaced with SA-515 (Specification for Pressure Vessel Plates, Carbon Steel, for Intermediate and Higher Temperature Service) and the SA-212 steel plate melted to finegrain practice was replaced with SA-516 (Specification for Pressure Vessel Plates, Carbon Steel, for Moderate and Lower Temperature Service). These two specifications-along with SA-299 (Specification for Pressure Vessel Plates, Carbon Steel, Manganese-Silicon), which has slightly higher room-temperature strength-were first published in the 1949 Edition of Section II. They continue to be used today as the carbon steel plate materials of choice for boiler and pressure-vessel applications. 1.Q2. Is it permissible to bring into and operate a used pressure vessel that was manufactured of SA-212 Grade B steel? The vessel was not impact tested when it was manufactured. 1.R2. A used pressure vessel made of SA-212 Grade B steel may be brought into and registered for operation in provided that its proposed design conditions meet the intent of the current ASME Pressure Vessel Code. Since the current Code requires a minimum design metal temperature (MDMT) for a pressure vessel, such an MDMT must be established for the used vessel using the current Code methodology. SA-212-B material would be considered a Curve A material for the purposes of Code paragraph UCS-66. Therefore, a maximum allowable working pressure (MAWP) that supports the MDMT without impact testing would have to be established. It is assumed that it is not feasible to impact test all the shell and head plates and weld joints to support an MDMT lower than that without impact testing.